Let’s review some the best ways to resist temptation. What people would find out by going to sleep at night as the sun is going down, is when they wake up they will feel amazing! After a proper night’s sleep, people will find that many things have been restored. The human body worked while you slept and was busy cleaning all the things that needed to be. People most likely experienced dreams while they slept and woke up feeling great. The best way to start each day which will help people steer clear of even the toughest temptations is the following these three simple things. Do these things as soon as you wake up in the morning. Take just 5 to 15 minutes to meditate upon waking. Following meditation choose books to read that are based on health, wellness, and healing. Remember to read books that explain how the body works and stay away from reading books on disease. Disease doesn’t exist, it is simply the absence of health. The reason it’s important to read first thing in the morning after you meditate, even for fifteen minutes, is because your mind is fresh and you don’t have the weight of the day on your mind. Reading for just fifteen minutes in the morning is the same as reading for 90 minutes at night. People in college who went to bed early before an exam and woke up far earlier than everyone else has a tremendous advantage. Their mind is fresh in the morning over those who stay up a good part of the night where their focus isn’t good and have to drink a lot of coffee for clarity. Next up, exercise. It’s important to get your body in motion and work up a sweat. Whether it be from walking, hiking, biking, rowing, it doesn’t matter, choose what you like so you stay with it and get your sweat on! Alternate certain days of the week where some focus on cardio and others on resistance training. Both are important in terms of exercise. Put in enough effort to create a sweat, that is where a benefit is achieved. 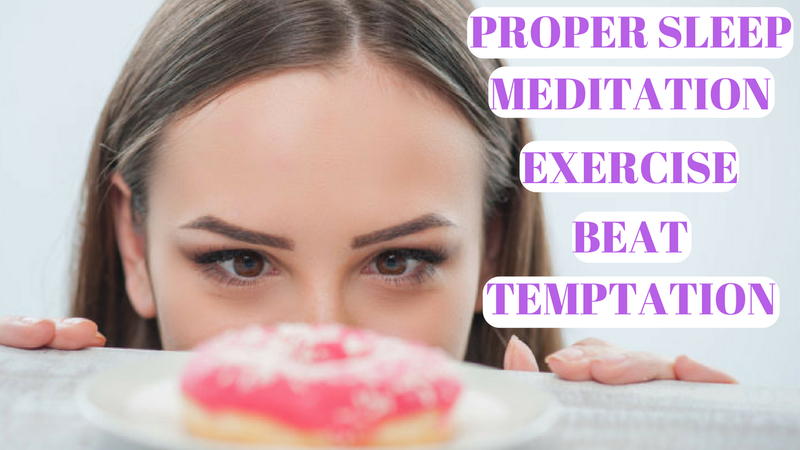 These are the ways to resist temptation which will help you in staying far away from the things you know that tempt you. Do doing these three things in the morning, you have cared for your spirit, your mind, and your body. You will now be leaving the house in the morning wearing your armor so to speak which will put you on the best path to have a healthy day and avoid temptation. Then throughout the course of your day when you’re out and about and encounter what would normally be a temptation and it is not even a second thought. You can now easily drive by a McDonald’s or a Dunkin Donuts, etc. and not feel the slightest temptation and keep right on driving.